Let me just share with you that I really do love Brussels sprouts. I understand, however, that not everyone likes them as much as I do, but I think that’s more a result of never having tried a really flavor-packed Brussels sprout side dish. These precious little green orbs, these mini “cabbage-like” cuties, are truly just a perfect accompaniment for any succulent spread—holiday, or not. 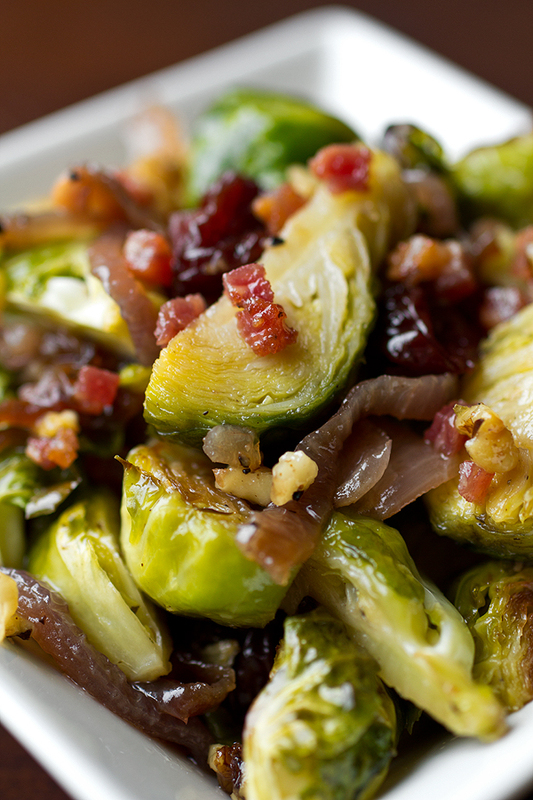 Simply roasted with a few bells ‘n whistles thrown in, Brussels sprouts are a veg that I have a hard time not continuously grazing on after they come out of the oven all lightly crispy and caramelized, slightly sweet and slightly savory. And I have a feeling that if you give these babies a try as a part of your own special holiday meal, they’ll make a lover of Brussels sprouts out of you yet—if you’re not one already. 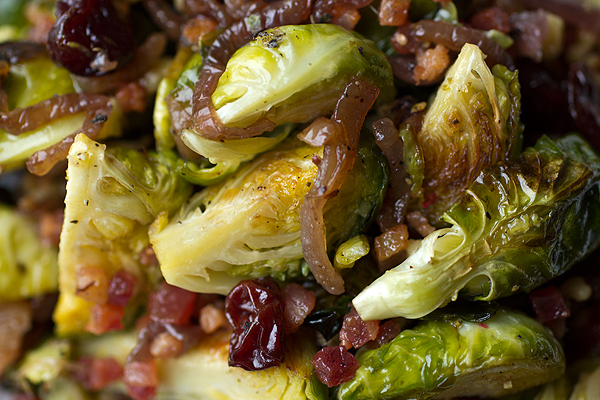 Brussels sprouts themselves aren’t complicated to prepare, and prepare well. They just require a little creativity in the add-ins department to really take them over the top and make them a stand-out side. Sea salt, freshly cracked pepper, some silky, rich, golden olive oil and about 25 minutes in a 400 degree oven transforms these little emerald-colored gems into perfectly crisp yet tender morsels. 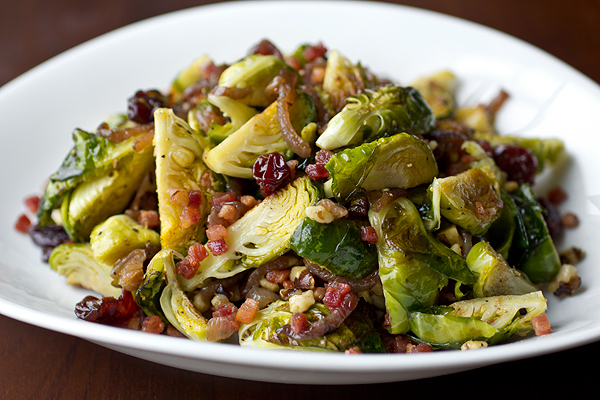 Add some lightly smoky, crisped-up pancetta, some glossy, caramelized onions, some sweetly tangy dried Montmorency cherries, and crunchy, toasted walnuts, all drizzled with a tangy cider-glaze, and you have a savory-sweet, gorgeously festive veggie side to proudly display on your table along with all of the other goodies that you’re serving. Leave it to the cozy holidays to inspire using some delicious decadences to take a vegetable side dish to the next level, and to bring out the gorgeous natural colors of the Christmas season, to boot. 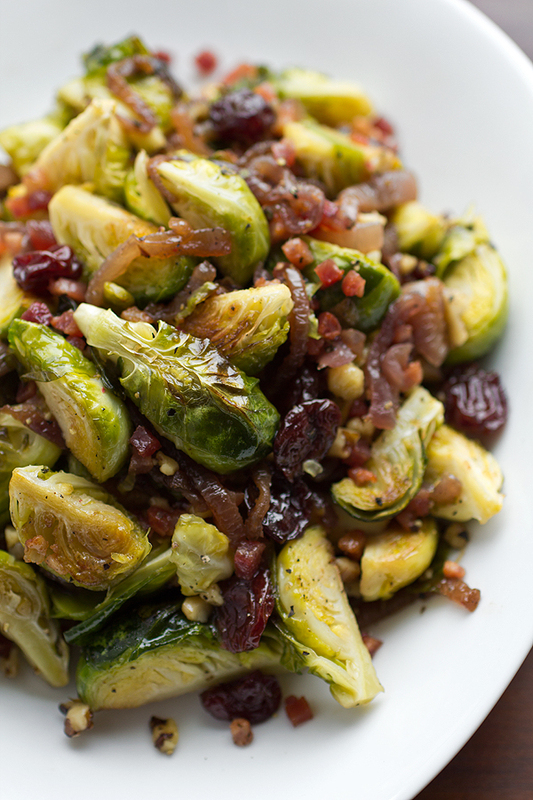 The holidays are about the flourishes, the tasty little touches that add so much to the meal experience; and with these scrumptiously roasted, cider-glazed Brussels sprouts with those delectable little “bells ‘n whistles” thrown in, you’ve got yourself a perfect little companion side dish that most everyone will surely smack their lips over. -Preheat the oven to 400 degrees, and line a baking sheet with foil. -Place a medium-size non-stick skillet over medium-high heat and drizzle very lightly with olive oil; once hot, add in the diced pancetta, and allow it to crisp up until golden brown, about 5-6 minutes; using a slotted spoon, remove the crisped pancetta from the pan and place onto a paper towel-lined bowl/plate to drain, and set aside; reserve about 2- 2 ½ tablespoons of the pancetta drippings, and discard the rest; next, lightly clean out the pan you crisped the pancetta in, and add back into it the reserved pancetta drippings, and turn the heat on the medium-high; once hot, add in the sliced red onion, and allow it to caramelize until golden-brown for about 15-20 minutes; remove from pan and set aside. -Next, toss the quartered Brussels sprouts with about 2 tablespoons of olive oil, the sea salt, cracked pepper and Italian seasoning; drizzle a little olive oil onto the foil-lined baking sheet, and turn the Brussels sprouts out onto the baking sheet and roast for about 23-25 minutes until golden-green and crisp-tender; remove from oven, toss in the reserved caramelized onion, pancetta, dried cherries and chopped toasted walnuts (if too hot, use a metal spoon to toss), and lightly drizzle the Cider Glaze over the Brussels sprouts, starting with about half of it, and using all, if desired. -Into a small, heavy-bottom sauce pan, add the ½ cup apple cider vinegar, the ½ cup sugar and 2 tablespoons brown sugar, and whisk together; place the sauce pan over medium heat, and once the mixture begins to simmer, reduce the heat to medium-low and allow the mixture to gently simmer for about 10 minutes, or until thicken up and syrupy; turn the heat off, and whisk in the remaining 2 tablespoons of apple cider vinegar; allow to cool slightly and drizzle over the Brussels sprouts while still warm; or to make ahead, completely cool the glaze and keep it in a small dish covered with plastic wrap in the fridge until ready to use, at which point you can gently re-heat it stove top. Hi Bernadette! Glad there are other brussels sprouts “lovers” out there – I’m finding out that there are quite a few more than I had thought! I love brussel sprouts too and this sounds over the top good. will try it soon. Not christmas as that is at my sons house and they don’t like them. Strange as that seems. Hi Pam! Well, no worries – at least you’ve got a new recipe to try out for yourself! Made this for Christmas dinner today! Thanks to you, I converted my mother, who has refused to touch a Brussels Sprout for 40 years, to eat and even have seconds! These are amazing!!! I made them for Christmas dinner and everyone raved about them. Thanks for sharing! Katherine, it’s my pleasure; thank you for sharing with me that they were a hit for Christmas dinner! I love this recipe and will now be a regular dish for Christmas. One thing I did notice is that you instruct to cook the onions and set aside. 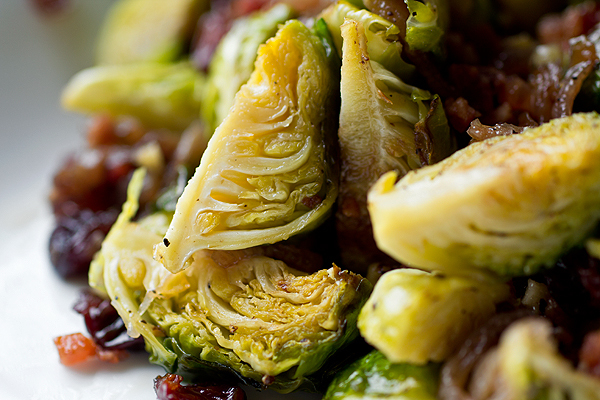 You never mention to toss them in with the roasted brussels sprouts. Thanks! Hi Jane! Thank you so much for bringing my attention to the little omission in the recipe so that I could correct it. I’m so glad you enjoyed the dish, and that it’ll be a part of your future Christmas spreads! Thank you for sharing your glaze recipe. I had already roasted Brussels Sprouts and Radishes with a little Olive Oil, Kosher Salt and Cracked Pepper and needed a way to jazz them up. I crisped up some finely chopped Jalapeno bacon and sprinkled it over the Sprouts and Radishes in their serving bowl and made your glaze. I served it next to the Sprouts and Radishes so the picky eaters could miss out on it, lol. Everyone that tried it, loved it. Thanks. Going to add your recipe to my secret stash of recipes. The ones my loved ones get to argue over when I die, j/k. Pat, the last line in your comment made me laugh out loud – thanks for that! So happy the glaze was enjoyed; and the way you prepared your sprouts dish sounds really yummy, too. Thank you for coming back to share with me! Having never tried Brussels Sprouts in my life, I decided this was the year. I looked high and low for a recipe that might interest me, and I found yours. These were AMAZING! Followed the directions exactly—didn’t change a thing; I’m loving every single bite! Thanks to you, I’m abrussels sprouts convert. Can’t wait to bring to Thanksgiving. 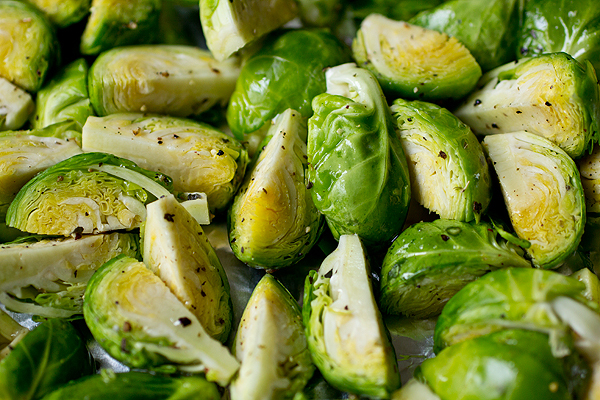 Heather, that’s awesome; glad to have you as a new fan of Brussels sprouts! Hope you enjoy these again on Turkey Day! Not only does this sound delicious, but it looks beautiful. Thinking of adding some roasted butternut squash to the dish. What do you think? Hi Caron, thank you! And I’d say adding in some butternut would be lovely…why not? Happy cooking!